Here’s the latest League One news on Monday February 11. 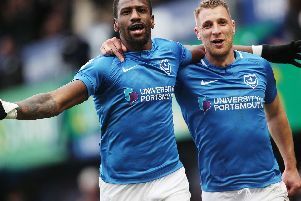 Pompey could only draw at Plymouth on Saturday, with Sunderland also getting a 1-1 draw at Oxford. ‘Barnsley Football Club can confirm that Kieffer Moore has been discharged from hospital,’ read a club statement. ‘The striker fell heavily in the 82nd minute of the Reds' 1-4 victory over Gillingham. He was assisted by the medical staff from both clubs and paramedics on the scene. ‘Kieffer will be continually assessed in the coming days, but is now currently at home resting. Close said: ‘I think we’ve been really hard done by on that. Everyone can see so clearly the ball has changed direction. ‘Obviously, first of all, I’m pleased for the team that we’ve managed to get a win here,”’said the winger. ‘It was my first league appearance for the club and so I’m delighted to have kicked that side of things off with a goal. ‘Strikes like that aren’t something I’ve practised all too often, especially on my weaker foot, but it was a great strike.